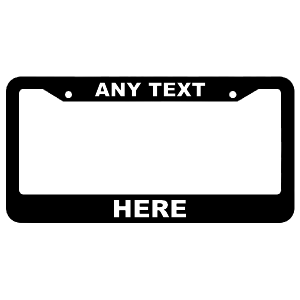 Our popular Customizable Thick Top-Thick Bottom Black License Plate Frame is an affordable way to add a personalized message to your vehicle. This lightweight frame is easy to customize with our online design tool and even easier to install! They are made from durable, sturdy plastic and will not rust. Custom license plate frames make great gifts. They are also an inexpensive way to promote dealerships, businesses, clubs, sports teams, and more! And it’s easy to save money on bulk orders with our custom wholesale license plate frames, which come in a variety of styles and materials. The frame fits most 6” x 12” standard auto license plates. Custom lettering is made with vinyl decals. We recommend checking your local laws to ensure that the style of the Customizable Thick Top-Thick Bottom Black License Plate Frame is legal in your state. Some states have special laws that may limit what parts of the plate can be covered or obscured by a license plate frame.